It’s 5.03am. 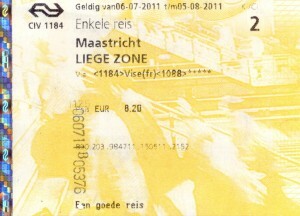 At 5.58am my train leaves from Maastricht to Liege. Today starts my camino de Santiago for real. I have a strange but good feeling thru my body. Where will I be this evening? Shall I find the correct way without a guide and route? What will happen with food and sleeping? All questions who flashes into your mind for a second. I take my backback which weighs 9.7 kilos without water. That is not yet necessary today. Crazy enough I’m not worried about walking during the camino in Spain. 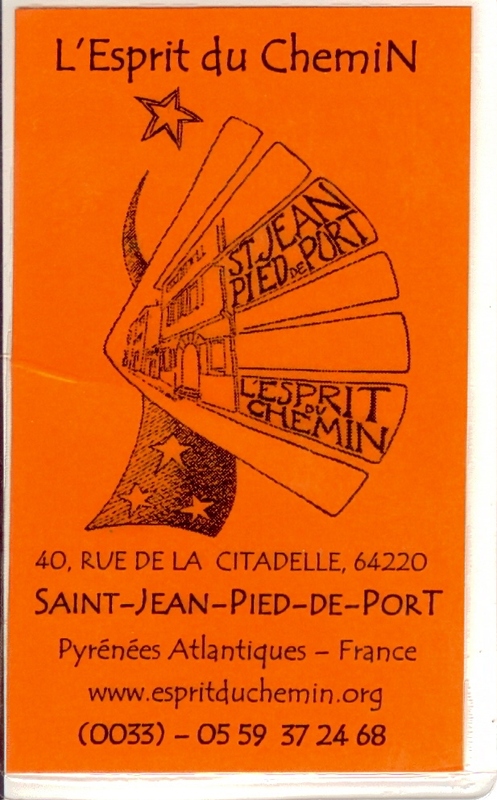 I’m worried about the train journey from Maastricht to Saint Jean Pied de Port. I have to take 3 transfers and I’m not exactly a hero with public transport. And I’m not thinking about my level of the French language. 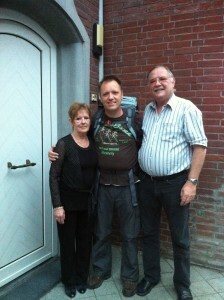 My mother and Arienne (good friend) wanted to say goodbye in Liege (Luik). They went with me from Maastricht to Liege (Luik). Arienne did support me to actual going to walk the camino. She knew about my personal questions I had regarding life on business level, personal and love. Arienne told me that she supported to walk the camino so I can have answers to these questions. To see what I want. I have received support from a lot of people but Arienne did support me in a special way from the start till the end. She said:”Go find yourself and look what you really want.”. In another, yet to write article, I will explain why and how I decide to walk El Camino de Santiago. There we were in the train… Already left the first country. The Netherlands. We drove really fast into Belgium. The trainstation in Liege (Luik) remembers of the station in Valencia. We drank a cup of coffee and I took the highspeed Thalys train to Parijs. In the Thalys there was WiFi available but I had promised myself during the camino not using a computer. Instead I read a book and became calm. Later on I remembered I could buy a metro ticket in the train. I asked where I could do this and they told me in the bar. 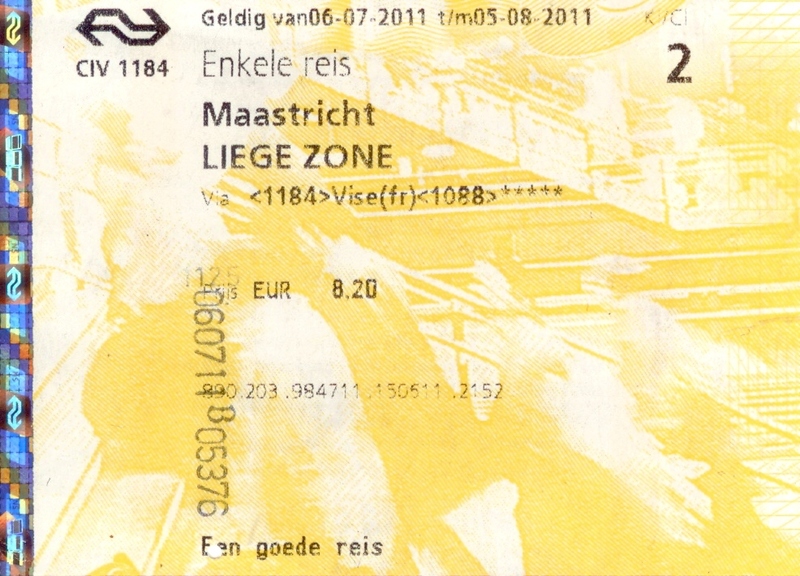 I got a metroticket for € 1.70. It was not expensive in my opinion as I remember it was a trip of almost an hour. 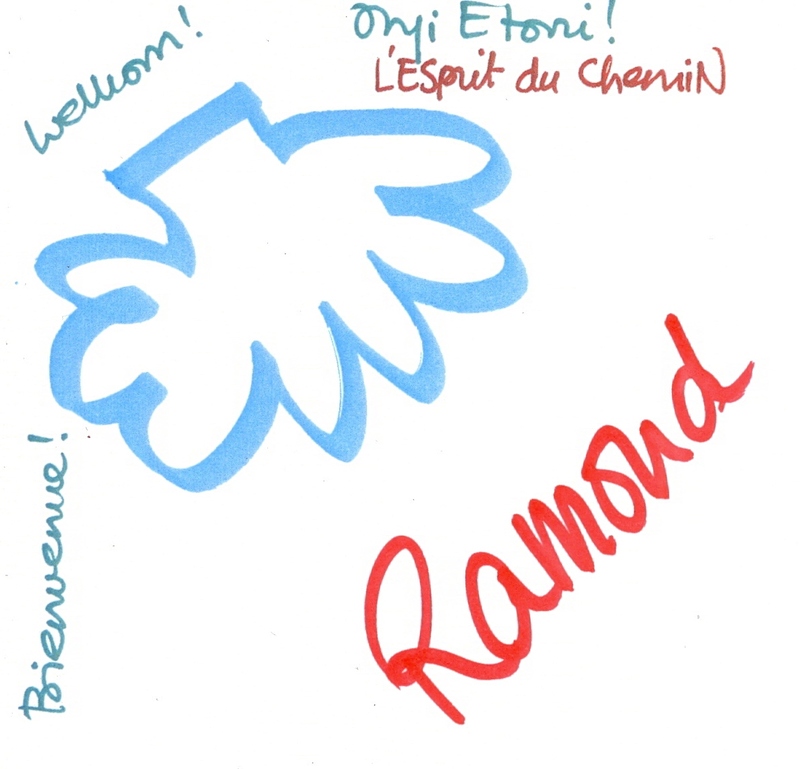 Everyone in the Thalys spoke English well. The bar was in wagon 25 while my seat was in Wagon 27, seatnumber 84. It is now 10.00am and there is a message in English, French, German and Dutch we have 20 minutes delay. For me this is not a problem as I have enough time to connect with the other train. When I arrived in Paris I called my mother to tell here I was safe in Paris. I took some time to enjoy my lunch. While looking to my other trainticket I saw something was written on it while the first ticket didn’t have this notice on it. What does it mean? I asked a French guy sitting next to me on the bench. He told me I had to stamp it to get it valid before entering the TGV. I walked to the informationdesk and waited some time. They told me I didn’t had to do anything. I didn’t believe it. I went walking towards the TGV and I saw a special informationdesk for TGV train only. I again asked the same question and the guy told me I had indeed to stamp the date of today on the ticket before entering the TGV otherwise being illegal in the TGV. I asked how and where to do it. The guy walked with me and did it for me. Really nice and helpful. They all spoke English and were helpfull. I was happy for that. I took place in the TGV. I noticed that in the TGV everything was in French. No more English or other languages anymore.. only French. There came the message. An announcement that there was 25 minutes delay. This meant that I lost my connection with the other train. I didn’t worry at that moment. That wasn’t necessary because they arranged busses to bring us to the destination. I asked a French couple what they said and they explained my slowly in French and I understood it correctly. Those train announcementsystems were really difficult to understand even if it was in your own language. I was sitting really relaxed in the train. I thought I just want to arrive this evening in L’Esprit du Chemin in Saint Jean Pied de Port and I’m feeling fine. I felt really relax. Arrived in Bayonne it was time to search for the bus. 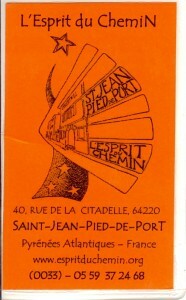 When I was outside the station there were several people pointing to the direction of the bus to Saint Jean Pied de Port. I went sitting in the bus. The final stage. I heard in front of me a guy speaking English with a Dutch accent. I asked where he came from. He said ‘Holland, Amsterdam’ and his name was Huib. We drove to Saint Jean Pied de Port and he was in the same Albergue as me. We walked inside and the people were waiting for us. We were in time to join the evening dinner. They did an introduction round. The people who I remember and also had a role during my camino are : Huib (Netherlands), Sarah and friend (Denmark), Solenne (France) and Damian (Germany). Solenne translated everything from English to French. The other people all understood English. Everyone said his name, age, where they came from and why they walked the camino. It were all personal reasons. After the dinner we were explained we had to get a stamp from the pelgrimsoffice and from the albergue. They gave a lot of useful tips for the first days. Really nice! Huib asked me if I was interested to start the camino together. I said I would like too because I’m not an experience walker. 2 find the way faster than 1. I’m going to sleep now. Tomorrow we will see what the camino will offer us. The walk of 784 km starts for real.